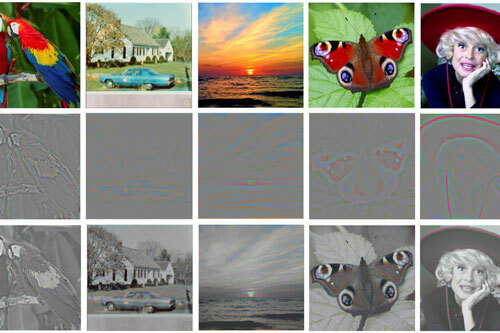 When we view natural images the colours we perceive are due to colour information at every local patch of an image, rather than the local colour edges as they transition from one colour region to another, according to a new study from researchers at City, University of London. The finding supports the role of uniform colour processing cells in the brain in interpreting colourful scenes. Previous work had suggested uniform colours were seen by an effect called colour ‘filling-in’, in which the brain uses just the information at colour edges to compute what the intervening fields of colour should be. Instead, the researchers found that this ‘filling-in’ effect only makes a small contribution to how colourful an images appears, as when natural images were restricted to such ‘edge transitions’ they did not appear to be very colourful. To investigate the effect, the researchers carefully filtered natural images to remove the colour differences except at the edges. When they carried out this process they found that the edge information was not sufficient to carry the colour perception in the regions where the colour had been removed. Conversely, it was also seen that purely chromatic images with maximally graded (‘edgeless’) transitions look fully colourful. As a result, the researchers conclude that while a weak ‘filling-in’ effect occurs, it cannot account for the rich colours we see in the natural world. This finding is significant, as it provides evidence to support the vital role that local colour processing cells in the visual cortex play in colour perception. Although historically most colour-selective cells were thought to prefer uniform colour patches, more recent work has identified a much higher proportion of colour edge-selective cells. However, the present work finds that colour edge selectivity plays only a marginal role in the colour perception of the world around us. This also has important practical implications as it shows that you cannot effectively compress image information to only the edge colour information. The study is published in the journal i-Perception.